This e-book allows you to really understand your painting materials, explore their raw features, and see how they were made. You'll find out what they're for, how to take full advantage of their capacities, and eventually make them yourself. Oil paint is a very slow drying paint, but in fact there are numerous ways to reduce drying times: absorbent grounds, alkyds, tempera underpainting and modern oil primers. Some depend on ancient recipes, others on modern products. All of these methods are discussed, and provided with recipes and product info. Do you want to sell your paintings? Then this book can save you a lot of problems. Classic oil paintings are known to last for ages, but oil paint itself is only a raw ingredient. You have to know how to use it, and only then your paintings will be as durable as the classic ones.If you don't know how to layer and mix oil paint, your paintings are in danger of peeling, cracking or turning brittle, in just a few years after completion. If you are (or were) an art student: this oil painting guide is for you. It contains vital material knowledge, that most likely won't be taught in your school. Still it's important, even for your artistic development as a painter. Layering adds depth to your painting. By developing your own way of layering, you define your own style as an artist. It's an artistic system as well, a way for you to navigate through your artistic process. And apart from that: if you want to sell your paintings, it's nice to know they won't fall apart. Art schools are great, but somehow material painting knowledge just disappeared during the 20th century. A specialist told me, that most 20th century art will be gone in 50 years, due to bad painting techniques. This oil painting book is an electronic book of 76 pages: lots of short, easy to survey text, with relevant pictures. It has a table of contents, inbound links, an index that allows you to find all the places where specific materials are discussed, and an appendix of recipes that can easily be printed (and taped to your studio wall). The price is 14,90 dollars, which is probably worth it, if it saves the life of only one of your future paintings. How to safely stretch a canvas to the wall. What to do with acrylic gesso. Choosing or making a wide range of primers. How to achieve quick drying. A wide range of underpainting materials and recipes. Choosing or making oil paint. How to use alkyd mediums. This book contains more than ten proven and tested recipes for making primers, painting mediums, caseine, shellac, rabbit skin glue, and oil paint. 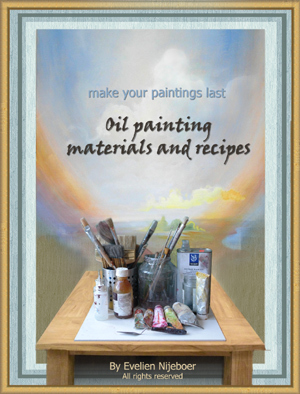 It also contains a product list, of good ready-to-use oil painting materials. You can use this guide either for doing classical oil painting techniques, or as a guide to just getting the best and most durable (modern) painting materals. Click here to see the table of contents. Oil painting materials really are no more than raw ingredients. You have to add medium to prevent cracks - but too much of the wrong medium makes chipping paint layers. Oil paint that has partly dried will look OK but peel off in no time, and if you paint lean over fat, your paint will crack. If your primer isn't suitable for the carrier you chose: cracks. Yellowing is also a thing that can be dealt with. In this oil painting guide, you can expect information to give you insight, as well as proven and tested recipes, for a wide range of primers, underpainting materials and of course oil paint. Using home-made materials can give your paintings an authentic look. There's more to oil paint than just that semi-gloss look of the equalized products the industry made for us. There can be depth, matteness, raw surfaces and high-gloss enamel paint, in earthy colors - or very bright colors. This can be done by adjusting ready-made materials, like canvas rolls, ready-made acrylic gesso etc, or by making your own gesso from scratch in the traditional way - with rabbit-skin glue, marble powder, pigments and oil. Home-made paints have an organic feel to them, and they're outspoken in their features. Not adding fillers makes the pigment quality fully come out. There are several recipes for underpaints (egg-tempera, egg-caseine, acrylic-caseine), and oil paint in this book. You'll also read about the features of ingredients like dammar varnish, stand oil and rabbit skin glue, so you can develop your own layering methods. Making oil paint is more work than making egg tempera paint (you might save that for another day), but egg-tempera is easily made, and on its best when fresh. This book is good for anyone who wants to go deeper into the material side of oil painting. It's a good book for people who have been painting for a while, or for beginners who intend to do so (and wish to develop good habits). And of course, for those who want to sell their paintings. As a beginner, it's good to develop habits that will keep your paintings whole for more than a few years. And, maybe even more important: layering techniques can become a way to develop a unique artistic signature, a way to do things that is both materially and artistically unique. As a more advanced painter, you'll find knowledge in this book that can help you find ways, to make your own specific way of painting more durable and safe. But you also might find new ways to create different effects, and to expand your range of artistic expression. But most of all, it's a book about the real, raw, matte and high-gloss side of oil painting materials. Acrylic gesso on itself is not suitable as an oil primer. But it can be mended, and you can also make it yourself. I'm sure the old, classic painters would have loved it. This oil painting book is about classical materials, but also ready-made products are discussed. It's designed for getting as much authentic value as possible, in the cheapest and easiest possible way. You can make you own oil paint, but you don't have to. The same goes for primers, canvases and varnishes. You'll also find the neccesary information on what ready-made products are good for your way of working. Here you can see the table of contents of this oil painting book. Well- I did (check my "about me"-page). I'm an artist. After completing two art schools, I've taken extra lessons in material oil painting techniques, at paintmill de Kat near Amsterdam. Here, one of the finest Dutch art materials specialists gives workshops on making paint (also oil paint). After learning there, I tried things out in practice for a number of years. This book is the result of that experience. 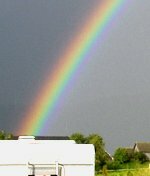 Ordering 'Oil Painting Materials And Recipes"
Paying can be done safe with paypal. As soon as you've made your payment, I receive an email with your name and adress, and I'll send you the ebook by email, within 24 hours (holidays excluded). Check the next paragraph to see if I'm available - if there is no next paragraph, I can provide service as usual. Of course, no shipping costs are involved.